Do you still believe that LINLEY stands for the last word in quality and supporting British craftsmanship? My name is Andrew Crawford – known as smartBoxmaker. I am an English box maker, teacher and author and in 2011 I introduced the smartHinge, a new box hinge representing a significant improvement over other box hinges available at the time. Because of their high quality, simplicity, elegance and exceptional ease of fitting, very soon they were being taken up by box makers all over the world, including several of the makers producing boxes for LINLEY, the high end furniture and accessory company founded by the Queen’s nephew, David Linley. Beautifully made and finished in the British West Midlands the smartHinge ought to fit LINLEY‘s publicly perceived criteria perfectly, but in 2013 the orders stopped coming and it soon became clear that LINLEY had had the smartHinge copied, without my knowledge or permission, and was having it manufactured in China at a fraction of the cost. Since then I estimate that LINLEY has sold around 1,500 boxes, some costing as much as £13,995, fitted with these poor quality, cheap Chinese-made copies through their showrooms. This has effectively deprived me of around £40,000 worth of business. The company is generally perceived as offering extremely high quality goods and supporting British craftsmanship, an impression reinforced by their proudly flying Union Jacks outside their showrooms and offering a variety of Union Jack themed accessories. Although the company has never denied the copying and admits that it was done purely to save money – and in the full knowledge that it is depriving me, a British craftsman, of legitimate business – when it has come to any material settlement they have simply refused to communicate. Just before Christmas 2017 an offer to buy the right to use the design was made by the current CFO, Kevin Blumenthal, but it was made on the condition that I signed a non-disclosure agreement – a ‘gagging order‘. This at least shows that the company is acutely embarrassed by its actions, as it should be, and the offer also re-confirms their admission of the unauthorised copying. But the amount being offered was derisory to start with, and I was expected to pay for the preparation of the gagging order! I rejected this offensive offer, of course, but despite my rejection the company continues to use the copied hinges. And to date I’ve not been paid a penny for their use of this design. The irony of LINLEY’s casual and dishonest appropriating of this excellent design is that the cheap copies they’ve had made in China [and they are cheap – less than a tenth of the cost of the real thing] are so poorly produced that they don’t benefit from any of the advantages of my original! For instance – on the genuine smartHinge the stop angle is set at 93˚ which allows even very heavy lids to be safely supported. The poor quality copies fitted to LINLEY‘s ‘Diamond’ jewellery box shown here open to a disgraceful 119˚! This allows the lid to lean way too far back putting a great deal of strain on the hinges … and this is a large box with a heavy lid containing a bevelled mirror. These hinges, costing £1.50 a pair, should have been thrown in the bin, and yet LINLEY considers it acceptable to fit them to a box costing £9,500 and are likely to fail eventually! and now, because I’m threatening to make the facts on this page public, this vindictive and deceitful company is seeking to prosecute me for blackmail! Yes, you read that right – the letter from LINLEY‘s solicitors is below … just click on ‘Blackmail! – a nice letter from Irwin Mitchell, LINLEY’s solicitors’. David Linley himself is no longer involved in the everyday running of LINLEY and my original position was that I had no argument with him personally over this. However, he clearly believes that his privileged origins entitle him to ignore the likes of me and I received no response from him, despite making multiple attempts at contact via several routes. the basic facts of this situation are as above – but read on below for some more shocking facts. click here – a detailed and constructive report on the LINLEY Chinese-made copies, submitted on April 14th, 2014. This was with a view to collaborating with LINLEY to produce an improved hinge to suit both our requirements. No response was ever received. click here – the smartHinge explained. click here – the LINLEY Chinese made copies – and other hinges. click here – LINLEY’s ‘Diamond’ jewellery box. click here – intellectual property. click here – a letter to David Linley – no response received. click here – Blackmail! – a nice letter from Irwin Mitchell, LINLEY‘s solicitors. click here – my response to Irwin Mitchell’s nice letter. LINLEY claims that ALL the boxes they offer, even the ones costing £9,500, would be rendered ‘commercially unviable’ if fitted with excellent quality British made hinges costing just £26.50 a pair. Visit LINLEY‘s Belgravia showroom at any time and see around 30 boxes that have the poor quality, Chinese made hinges fitted costing just £1.50 that are direct, exact copies of the ones I have developed. These include several boxes costing £9,500, and even one costing £13,995! This includes their ‘Diamond’ range of jewellery boxes, as well as their ‘Circus’ and ‘Velveteen Parma’ jewellery boxes. This next image shows the main banner on LINLEY’s website just before Christmas 2017. The box featured, their ‘Circus’ jewellery box, costs £9,500 and has the £1.50 hinges fitted. On the example I saw in the showroom the stop angle wasn’t so extreme as on the ‘Diamond’ box I refer to above, but still opening to around 110˚ which is way too far. As well as being fitted with very poor Chinese made hinges, none of the hardware on the £9,500 ‘Diamond’ jewellery box shown below even matches! The positioning of the screws is inconsistent – some elements are round ended, some square ended. From a hardware point of view, this is just a poorly thought out mess with no consistency or design integrity! The image above shows the ‘Jacky Tsai’ box, and Jacky Tsai and David Linley at the unveiling of the collaboration. This box costs a whopping £13,995, but still has a pair of the poor, cheaply produced hinges costing £1.50 fitted. Presumably it would also make this box ‘commercially unviable’ to fit it with a pair of good quality, British made hinges costing £26.50. 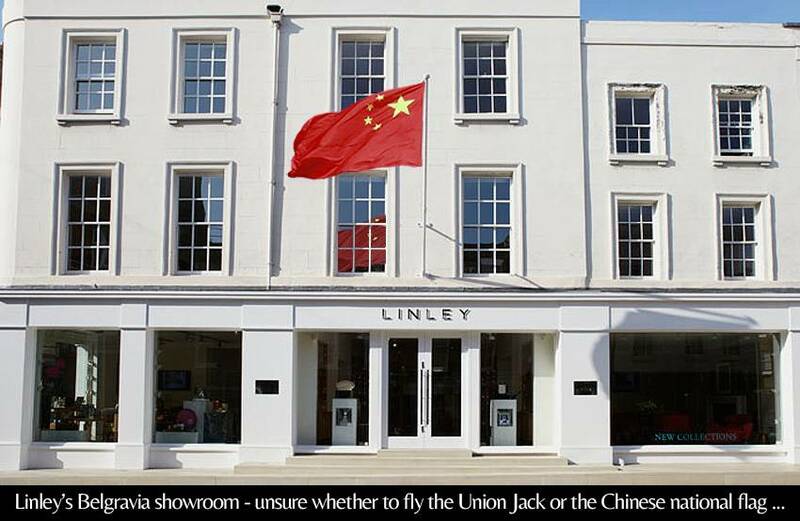 I wonder how Jacky Tsai would feel about THAT example of LINLEY’s commitment to high quality and British craftsmanship?! On the other hand, the boxes shown below are just a very few examples made by the superb high end makers who are my regular customers from around the world who have the integrity to use real quality. And, incidentally, these excellent makers charge a small fraction for their work that LINLEY does! You will note the near vertical position of the lids in all cases, which is correct, as opposed to the extreme laying back of LINLEY‘s ‘Diamond’ jewellery box and many others, which is incorrect. I have tried to get this disgraceful situation settled twice, once in 2014 and again in 2017, and broadly speaking both attempts have met with the same sequence of responses: firstly with apology and courtesy, and ‘shock’ that this should have happened at all. Then on both occasions [accountants and lawyers stepping in?!] the initial courtesy and cooperation have quickly evaporated and turned to evasion, and then ultimately to a refusal to communicate in any way. Attempt 1: Having visited their Belgravia showroom in March 2014 to confirm for myself that they were indeed using identical hinges [that didn’t come from me] I had an informal meeting with the then Head of Production, James Oliver. He denied any knowledge of the copying but agreed to look into it. During a phone conversation a few days later, James Oliver confirmed that the copies were made from drawings taken directly from my smartHinge. Further, he admitted that this should not have happened and that some compensation should be payable. He even named the company that had organised the copying and arranged for the manufacture in China and sent me several pairs of the copied hinges for me to study. As a result of the poor quality and inconsistencies of the Chinese copies I was sent I prepared an extensive report on their quality on the understanding that a collaboration to our mutual benefit was on the table. That report was never responded to or even acknowledged. At a meeting on April 28th, 2014 with the Artistic Director, Alex Isaac and James Oliver, various ways of collaborating were discussed in order to move forward and resolve the issue of the unsanctioned copying in a mutually advantageous way. After the meeting it soon became clear that this had been a ‘fobbing off’ exercise as no effort was made to action any of the strategies we had discussed and no one at the company would answer my communications. When I did finally manage to bludgeon a response out of the company, 8 weeks after that meeting, it was a brief, dismissive email from Alex Isaac shutting the door on any future collaboration. Attempt 2: a meeting at Pimlico Road on Dec 20th, 2017: since the company had once more completely refused to communicate with me, I had no choice but to visit the Belgravia showroom in Pimlico Road, unannounced, with a view to forcing a meeting with their current CFO, Kevin Blumenthal. I was told he wasn’t available, of course, and to email to request a meeting in the new year. They threatened to call the police if I didn’t leave. I rejected their offer, of course, but does my rejection mean that LINLEY has stopped using the copied hinges? Of course it doesn’t – they continue to benefit from their use, without my permission or having made any payment, to this day. LINLEY clearly markets itself on its ‘Britishness’ and support for British craftsmanship, not least because of its very real connection to the Royal family. It also purports to be offering the highest possible quality. But in the case of these hinges it’s demonstrably doing neither. Instead it’s giving business to a Chinese company over a British one, sacrificing any vestige of quality for extreme cheapness in the process. It is deliberately fitting extremely poor quality cheap hinges to very expensive boxes which the public are being led to believe are the last word in quality. 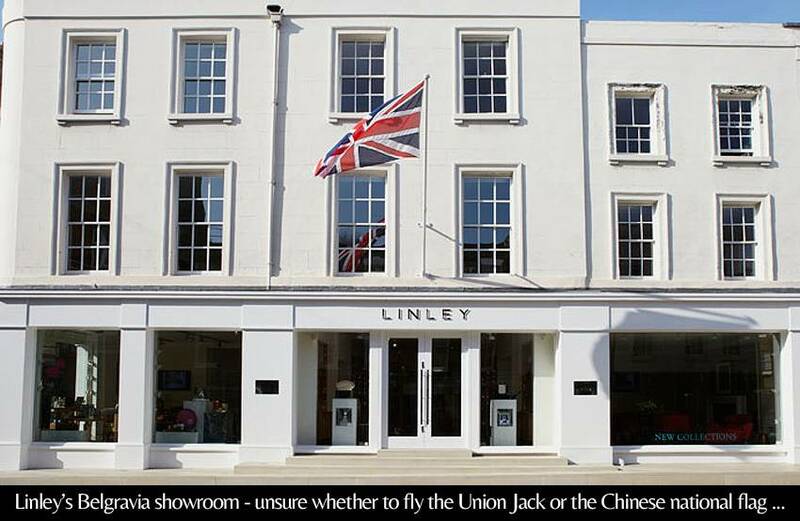 As well as flying Union Jacks outside its showrooms, LINLEY offers boxes with Union Jack marquetry motifs on the lids and other Union Jack themed accessories. In 2001 the company introduced the ‘Aston chair’ – I quote from the LINLEY heritage website: “ … the name ‘Aston’ evokes associations with another great British marque, Aston Martin”. The design of my smartHinge isn’t protected by patent. It would have been hugely expensive, beyond the resources of an individual, and in any case not appropriate for a relatively low volume, niche item like this. Also, because this design is so distinct, immediately recognisable and widely associated with me, there really didn’t seem to be any point. But ethically and morally does that mean that anyone can simply step in and casually copy it for their own benefit?! No, of course it doesn’t, but LINLEY clearly believes that it has some sort of impunity due to its size and reputation and is therefore exempt from generally accepted moral and ethical behaviour, and presumably assumed that it could ‘get away with it’ and save some money! The genuine smartHinge offers makers many advantages over traditional box hinges. The irony of LINLEY’s casual appropriating of this excellent design is that despite being ‘exact’ copies drawn up from my originals, cheap production methods and materials mean that they suffer from many inconsistencies and quality issues – not least the leaf width and the stop angle which varies widely, allowing some to go back as far as 119˚ as seen on the ‘Diamond’ jewellery box above. Consequently LINLEY’s Chinese made copies benefit from almost NONE of the advantages of the real thing! Incidentally, although LINLEY’s copies are made in China I should make it absolutely clear: I have nothing against China or Chinese manufacture as such, much of which is certainly very high quality! My point is that, bearing in mind the company’s connection to the British Royal family and David Linley’s often repeated support for British craftsmanship, they should have been using genuine, top quality, British designed and made hinges. Instead they chose to sacrifice quality – and Britishness – purely to save money. In my dealings with LINLEY I have been told: “we are a large company” in an attempt to excuse a failure to “ … keep track of the provenance of every little piece of hardware” – Alex Isaac, Artistic Director, in a meeting at the LINLEY Pimlico Road headquarters with him and James Oliver on Monday, April 28th, 2014. LINLEY hasn’t divulged the exact number of boxes that they’ve had made and sold using the copied hinges. And given their devious and uncooperative behaviour in all of this, there would be no way of knowing if any figures they declared would be accurate anyway … A visit to their showroom at any time will reveal around 30 boxes that have the copied hinges fitted – a back-of-the-envelope calculation extrapolated from figures given to me by James Oliver in 2014 indicates that the figure of 1,500 I’ve given above is about right. important: I have a complete record of my dealings with the company, including recordings of our meetings. Every single fact I have set out here is 100% true, accurate and can be proved. We really enjoyed ourselves and learned so much – thank you for being so patient! Thank you too for all this follow up information – very helpful. I keep thinking about all those cuff links………madness! Hope to see you again soon.